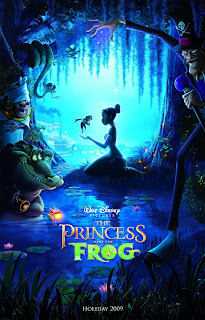 The Princess and the Frog is Disney's latest 2-D animated feature and their first since Brother Bear. It also marks the appearance of Disney's first black princess. The story follows a lonely waitress named Tianna as she works two full-time jobs to help save money to open up her own restaurant. All that changes when a visiting prince is put under a spell that turns him into a frog and in a case of mistaken identity, asks for a kiss while she is dressed as a princess. Well folks, Disney has done it again! The Princess and the Frog is an outstanding piece of animation that hearkens back to the golden age of Disney and is all the better for it. Everything you grew up on and loved about Disney films is here. Humor, action, songs, and wonderful animation. This is a film that will hold up for years to come and will take its place amongst the classic films this studio has put out. The film uses its setting EXTREMELY well and touches on all the aspects of New Orleans culture. From the food, music, people and even the supernatural (more on that later) Disney gives New Orleans the royal treatment here as a celebration of one of the most vibrant cities in our country. As I mentioned before, the music is some of the best in any Disney film to date and plays heavily into the jazz/zydeco music of the region. It's so fun and lively that the soundtrack would be a great addition to any audiophile's library. The characters are fully realized and have wonderful arcs that lead them to real change by the end of the film. And you CARE. I really cared about all the characters, from Tiana and Naveen right down to Raymond the firefly. Even the shadow man is one of the best villains of the year. But this should be said right now, the shadow man is a practitioner of voodoo and the film really goes to great lengths to show the downside of playing with the darker forces in this world and sometimes, in all to real ways. This leads to some of the darkest sequences Disney has ever done, so be careful as the parent here. The voodoo is never glamorized or shown as a good thing at all, but it might raise some questions from the kiddos you're not quite ready for. When all is said and done, The Princess and the Frog is nothing groundbreaking for Disney and that's what makes it work. This is the kind of quality animation we've come to expect from this studio for years and I personally hope they continue to deliver it for many, many more.